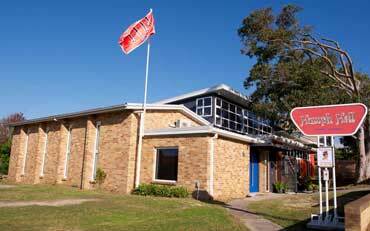 JAM - NSW Folk Federation :: Enzo Toppano & Vov Dylan return to Humph Hall! 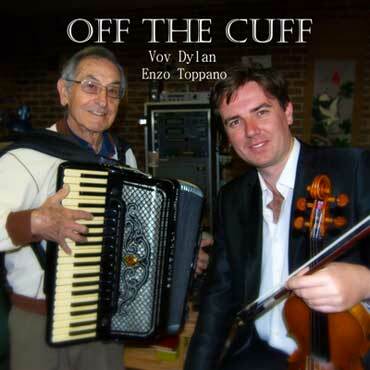 Enzo Toppano & Vov Dylan return to Humph Hall for another 'Off the Cuff' afternoon! 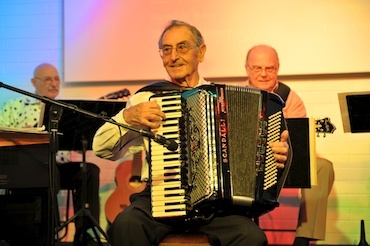 Enzo's 83rd birthday celebration in 2011 with numerous celebrities including George Gola, Bob Barnard, Peta Toppano and Barry Crocker, was the biggest event Humph Hall has ever seen. 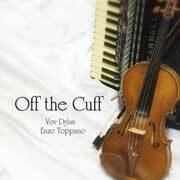 Last December Enzo and Vov launched their new CD 'Off the Cuff' here and now, due to a fortunate opening in their timetable, they are back again together with Mark Howard (double bass) and Brian Dean (guitar). This is an afternoon not to be missed! Early bookings strongly recommended! Call or email Wayne (02) 9939 8802 to reserve your seat while there are still some left! Visit the Vov Dylan web site. As with all concerts in Humph Hall, Enzo and Vov will be performing acoustically - no PA system!